Nazi Gold isn’t afraid to get into primal, dark areas of the subconscious on their latest EP Climbing the Tower from Super Secret Records. They're examining the repressed urges that lead to real evil, these aren’t the usual tunes about relationships, Nazi Gold is after ancient power like the arc of the covenant. With the classic trinity of drum, bass and guitar played by the serious talent of Thor (Swans), Jeremy Steen (Fleshlights) and Quin Galavis (Dead Space) respectively, you realize these guys actually have the nerve and skill to go after those monsters inside. “We Make War” opens with Jeremy’s no effects bouncy bass, wired right into the board, heavy on the right channel. Broken staccato chunks of guitar distortion from Quin is the bluesy response to this slight groove and Thor brings an off kilter odd time to the rite. Quin’s vocal works alongside those blasts with his own primal melody lining up a bending blues distortion riff. Always on the edge of that precipice they launch into the chorus “WE MAKE …. WAR!” with tom bashing and gashes of distortion. It’s an epic track of their own sonic destruction that expands with an organ and what’s got to be an oboe for a measure in the calm before the storm, interrupted by more blasts of heavy rock, but it’s those subtle additions of classic instrumentation that give the record an even heavier weight. The track isn’t over yet either and they ramp that chorus back up after fading out, but isn’t that how war goes... just when you thought it was over. “Maria” has a barely audible spanish stick count and Thor’s odd rhythms again with a muted, battle scarred cowbell and muffled rattling high hats. Quin alternates his vocal between following that bass melody and breaking out into an echo late ‘70s metal sound in the chorus calling to the mother figure Maria. They’ve got a Tomahawk feel here, in their more progressive free jazz meld of metal and rock. The narrator is calling on Maria, failing to help these victims. It’s a hopeless situation they approach with complex precision and mysticism. An intellectual heavy sound that shifts and starts to careen out of control, the bass running infinitely faster only to fall out completely leaving just the guitar. Settling back into that original groove the reel to reel starts to spin down slower with a shift in pitch, the feedback becoming something else entirely. They aren’t slowing down the performance they’re leaving it to the mechanics of recording to do the breaking down completely. B-Side’s “Crave” opens in a see saw guitar up and down the frets with a scuzzy distortion in that seasick rhythm. The lyrics narrator is just getting right to the point, he wants money and this tom filled loop and chanting ritual is going to get it. The gregorian chant inspired vocal underneath is taking this into a religious place. More guitar stutters stumble into rhythms which are the driving force of these tracks. The dirge smashing triggers something primal and they revel in it. But with any false sense of order and control this devolves into chaotic guitar and tom fills that eventually slow down to rest. 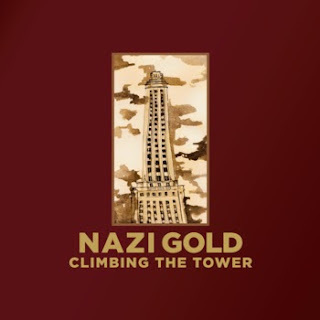 The final track, “Climbing the Tower” comes out with a new energy, ancient power chords blasting with heavy bashing from Thor like Harvey Milk dropping just as quickly down to a single kick and bass. Quin takes this break to describe a the bible revelation surrounding the character in the form of this tower with all of his great sense of haunting prose. When this apocalyptic scene combines with those thunderous shots from the opening there’s no limit to these heights. It’s a hypnotic track, based around the internal stomp and an organized chaos that creeps in between blasts. The only thing that might offer some kind of solution; belief in a higher power, is absent. They’re describing a world where if you don’t want to climb that tower then you’re destined to be another rung, a foothold for the next guy climbing his way to the top. Get your Nazi Gold from Super Secret Records - on white vinyl of course.